Dr. Kevin Jones, a distinguished professor and Frederick N. Rhines Professor of Materials Science and Engineering in the Department of Materials Science and Engineering, has been named The University of Florida’s 2017-2018 Teacher-Scholar of the Year. This is the oldest and highest award given by the University of Florida. From anthropology to zoology, Jones joins more than 50 top faculty from across the university who have received this prestigious award since 1960, but there is one fellow recipient with whom he is particularly honored to share this recognition: his father. Jones is the son of Dr. William Jones, professor emeritus of the Department of Chemistry. William Jones was the UF Teacher-Scholar of the Year in 1989-1990. 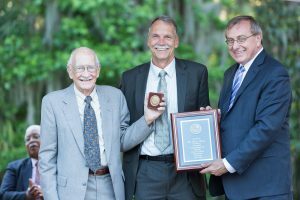 UF President Dr. Kent Fuchs recognizes Dr. Kevin Jones (center) as the 2017-2018 UF Teacher-Scholar of the Year, and Dr. William Jones stands by his son’s side 28 years after he received the same honor. Jones remembers that, when his father won, he was quoted in the Alligator as being “tickled pink” when he was notified. “I think that is the best description of how I felt when I learned I had received the award” Jones said. The tradition of teaching excellence is steadfast in the Jones family. In addition to his father, his grandfather, grandmother and uncle were all professors. Jones was pretty confident that he wanted to be a faculty member during his undergraduate years at UF. It was, after all, the family business. Jones knew before he entered the classroom that he wanted to get some experience as an engineer, so he could talk to students about what it’s like to work. He spent a couple of years working as a plastics engineer for DuPont before pursuing his Ph.D. at the University of California at Berkley. After finishing his Ph.D., Jones had offers from other universities, but the University of Florida was his dream job. He joined the UF faculty in 1987 and hasn’t looked back. Jones is passionate about teaching and mentoring. He has graduated 40 Ph.D. students and has worked with countless undergraduate students. His proudest teaching accomplishment is seeing his students succeed and feeling like he had an impact on their academic journey. “Every year there is this sense of rebirth. You get to know new students and get swept up in their enthusiasm,” he said. While Jones enjoys working with both undergraduate and graduate students, he has found his passion in sharing his specialty with both engineering and liberal arts freshmen students through his class “The Impact of Materials on Society” or IMOS. Jones is the primary instructor of the course, and he is joined by liberal arts faculty from sociology, humanities, English, anthropology, history and classics throughout the semester. The goal of the class is to create more socially aware engineers and to help liberal arts students increase their understanding of engineering. Upon stepping down as department chair in 2010 he dreamed up the idea of this freshman cross-college class. “The real stroke of luck came when Dr. Sophia Acord, Associate Director of the Center for the Humanities and the Public Sphere, said she would be happy to help organize this class. Without her tireless work on this, the class would have never happened. She did a tremendous job of finding great liberals arts faculty members who were willing to sign on to such a crazy idea,” said Jones. Jones also points out that young adults today are interested in the bigger picture – not just making money but how they can innovate in ways that help others. The IMOS class focuses on how engineering innovations have been integrated into society and how they have been received by different audiences. “Understanding the entanglement we have between materials and society in the past increases the probability that future innovations will be successful and hopefully change the world for the better,” Jones said. The class has been so successful that NSF and the DoD have supported its dissemination around the U.S., into Central and South America and most recently into universities in Africa. Time magazine even had an online article on the class. Jones’s own research focuses on semiconductors. His work is concentrated in studying and aiding the computer chip industry to make its product better. Companies like Applied Materials, Intel and IBM find this chip research very useful and support and hire most of his graduate students. Jones’ father has passed down more than just a love for teaching. William Jones hosted a pig roast for his students for many years at the end of each academic year. Twenty-five years ago, he handed over the reins and the outdoor pig roasting equipment to Kevin. Originally Jones held the pig roast just for the juniors from the materials science and engineering department; but students had so much fun, they asked to be invited back for their senior year. Each year, Jones asks the juniors if they would be willing to extend an invite to the senior class as well. They always say yes. Jones gets up at 6 a.m. to get the pig on the fire. By 5 p.m., after a day of volleyball, Frisbee ziplining and swimming, the group of nearly 100 students are filled with food and laughter. “It is always such a blast, and it is wonderful to see the students relax and enjoy themselves. College is a great opportunity to push yourself intellectually but it also should be fun,” Jones said. The pig roast is something Jones and his father will also remember and share, along with their Teacher-Scholar of the Year award.